Hoiho are found on the sub-Antarctic Auckland and Campbell Islands. The birds in the subantarctic are genetically distinct from those on the mainland, as they very rarely mix. The Auckland Islands / Maungahuka, at latitude 50 degrees south, are the largest of Aotearoa / New Zealand’s subantarctic islands, with over 500 km of coastline, much of it steep and inaccessible to penguins and people, particularly on the exposed western side. Uninhabited now, the main island was once farmed by a hardy few, whose legacy is feral cats and pigs. Surprisingly, rats have never managed to colonise the islands. The Campbell Islands / Motu Ihupuku is an uninhabited subantarctic island located in the Southern Ocean approximately 700km south of New Zealand and 270km south of Auckland Island. It was gazetted as a nature reserve in 1954 and is best known as the home of the albatross, with six species in residence, including the largest albatross: the southern royal. 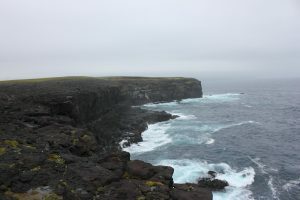 Campbell Island also has a long history of sealing, whaling and farming. David Smith, YEPT Trustee and experienced seaman, crewed aboard the Evohe for a further trip to the Auckland Islands / Maungahuka. The purpose of this trip was for Natural History New Zealand (NHNZ) filming the next series of Our Big Blue Backyard. On this trip hoiho were observed feeding on a school of bait fish only 30 metres from the shore, a sight not seen on the South Island coast, however, quite common to observe in the winter months down there. The overall objective of the surveys is to gather information that will help obtain an accurate hoiho population estimate for the entire Maungahuka / Auckland Island group. Fewer locations could be counted than in previous years because of the requirement for two counts at each site, and weather impacted the counts carried out by the Evohe-based group. Rose Island and Derry Castle & Bones Bay were counted twice on consecutive days, Adams Island was counted twice with one day between counts, and only one count was carried out at Waterfall Inlet and along the south-eastern coast of Enderby Island. Six counts were carried out at Rocky Ramp and Sandy Bay. The aim of this trip was to repeat surveys of hoiho initially carried out by Peter Moore in 1989, and continued by a similar Conservation Volunteer Project in November 2012. The overall aim of the surveys is to gather information that will help obtain an accurate hoiho population estimate for the entire Maungahuka / Auckland Island group. The Trust again supported this trip by sending a staff member. replacement of gas cooker and removal of freezer from Enderby hut to refit compliant gas lines. In 2012 the Trust again supported a Department of Conservation (DOC) led expedition to survey the hoiho at the Maungahuka / Auckland Islands. The trip aimed to build on the distribution survey carried out by the Trust and DOC in 2009, and repeat beach counts last carried out in 1989 by Peter Moore. 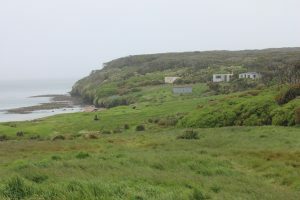 Along with beach counts, a team stayed on Enderby Island to nest search, mark the breeding birds, and carry out beach counts to help interpret the data collected by the rest of the team. The team of 12 was made up of DOC staff, Trust staff and 6 volunteers that contributed to the cost of the expedition, and were based off the yacht ‘Evohe’. With just 11 days for the survey including travel time to the island it was expected that beach counts will be carried out every morning, before repositioning the boat in the afternoon and scouting the next site for locations of each observer for the next morning’s beach count. Visiting the islands between 6 November and 7 December 2009 were team members Leith Thomson and Sandy King (both representing the Yellow-eyed Penguin Trust), Jo Hiscock (team leader, DOC), Jo Ledington and Callum Lilley (DOC), and Kate Beer (Wildlife Management student from the University of Otago). The Trust contributed to the cost of transport and accommodation provided by Henk Haazen on his 15m yacht Tiama. Crew member Steve Parsons completed the team of eight. Almost 200 km of coastline was surveyed, with identification of 301 landing sites. These were regarded as a minimum because some sections of coast accessible to penguins couldn’t be surveyed because of sea conditions. Most landing sites would be used by one or more pairs, though probably some would be used by non-breeders. 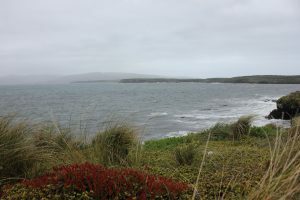 The pig- and cat-free islands had more landing sites per kilometre of coast surveyed than the main island, which raises questions about the impact of these animals on hoiho and other ground-nesting birds. Areas of the main island adjacent to these islands – the northern shore of Carnley Harbour, and Port Ross and northern harbours – also had a higher number of landing sites than the coast in the middle of the main island. This suggests that perhaps the predator-free islands act as reservoirs whose overflow sustains the population. The Trust was the recipient of Heritage Expeditions ‘Cruise for Conservation’ which not only donated funds from each passenger to the Trust’s work, but provided a berth for a representative on this trip. 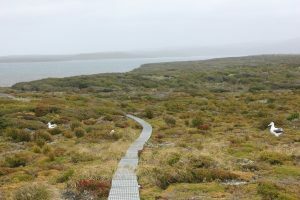 Sue Murray, General Manager went on the Spirit of Enderby cruise, spending a week on Campbell Island, the main Maungahuka / Auckland Island, and Enderby Island. The three locations were quite different as each had some of its own unique flora and fauna. Disembarking onto Enderby Island the passengers were greeted by a group of nine hoiho. Throughout the day they saw hoiho constantly: adults, juveniles and chicks.